The workflow engine is a rules-based system that automatically sends email notifications, creates tasks, or performs an action when a user-defined event occurs. Company Workflow rules are triggered by Workspace Properties. We also offer workflow rules for databases and workflow rules for files and discussions. Note: Workspace workflow rules are configured on the Company Setup page. Only Company Admin can create and edit Workflows for Workspaces. 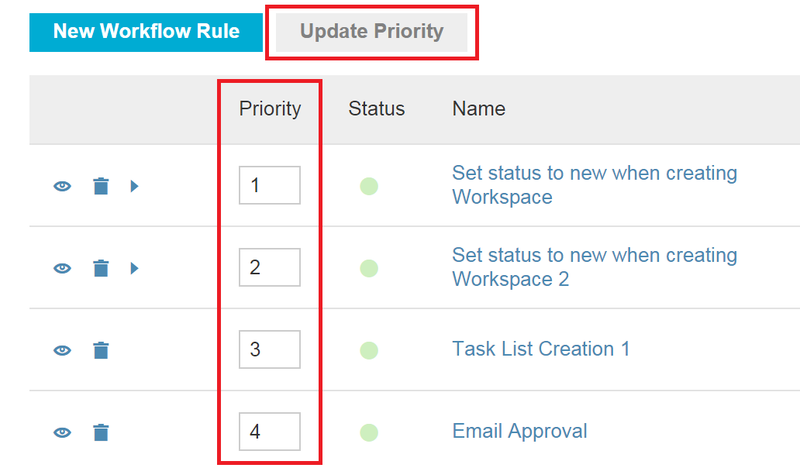 Company Workflows rules will trigger in the order of the displayed priority on your workflow list. Here is more information on how to link your workflow rules. 1. Name: Enter a name for the rule. 2. Type: Choose the type of rule: Email Notification, Task Creation, Task List Creation, Milestone Creation, Action, API Callback, or On Task List Completion. 3. Linking: Allows rule to be linked to other rules. Learn more about linked workflow rules. Created/Added: Triggers when a workspace is created. Modified: Triggers when a workspace property is changed. Checked Nightly: Workspace properties are monitored nightly to see if the rule's conditions are met. Checked nightly workflow rules also have the option to run now. "and is changed": This means that the field must have been changed to the inputted criteria when the Workspace properties were edited. "and matches": This means that the field can simply "match" and is not required to have been changed in order to trigger the workflow rule. Below is an example of a Task creation workflow rule. I've set it to trigger when the "Project Editor role is assigned and is changed". This means that when a user is assigned to the Project Editor role a new task is created in the workspace. In Task Details I've specified that the new task is titled "Editorial Review" and assigned to the project editor. I've selected the option to notify the editor when the task is created. Note: The next steps apply to Email Notification and Task Creation workflow rules. For Action type rules please scroll down. 6. (For Milestone Creation rules only) Choose a Milestone Template and Milestone Properties Form. Start Date and Due Dates can be set with a variable. When choosing a start or due date you'll need to know if your Milestone Template is set to “work forward” from an anticipated start date or “work backward” from a projected due date. 7. (For Task Creation rules only) Use the Task Details section to enter the specifics of the new task or task list. Choose a Role to assign to the task (optional). Choose "Notify via Email" if you'd like them notified when the task is created. 8. The subject and body of email notifications can be customized. To insert a variable, select it from the "Insert Variable" drop-down menu. Set the cursor in the subject or message body where you want to put the variable, then click the Insert button. If you choose a Role variable, the name of the user assigned to the role will be displayed. 9. (For Action Worfklow rules Only) Create the "action" you want the rule to perform based on your criteria. All of these criteria must be met in order for the Action workflow rule to trigger. The Workflow engine is a powerful tool. If you are unsure of your initial configuration, we suggest testing the rule in a test workspace to confirm that it is working as you've intended. Any workflow rule that has the Checked Nightly option checked will have an additional option to be triggered immediately. When viewing a "Checked Nightly" rule from the workflow list, a "Run Rule Now" icon will appear. Clicking on this button will fire the rule on-demand and trigger any e-mails, tasks, or actions designated by the rule. Workflow rules can be deleted by clicking the 'trash can' icon within the 'Company Setup - Workflow' page. Note: Workspace workflow rules do not trigger on Workspace Start Date and End Date. As an alternative you can create a customer date field in place of these.